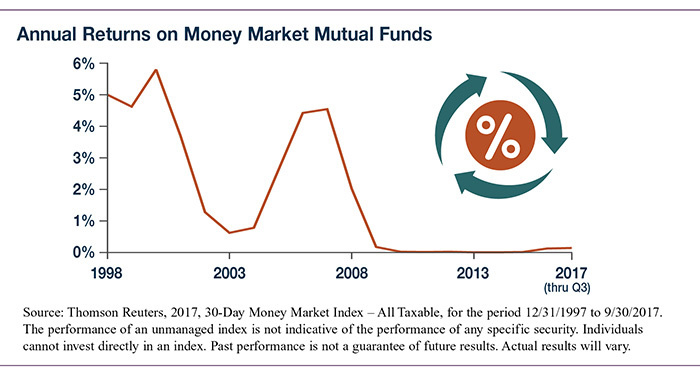 After six years of near-zero returns, the yield on money market mutual funds began to edge upward in 2016, with 30-day taxable funds returning 0.13% for the year. This may not sound like much, but it's a big jump from the 0.01% to 0.03% yield during the 2010 to 2015 period. The uptick continued in 2017, with a 0.15% return for the first nine months of the year (see chart). Even with the recent increase, which reflects the Fed's efforts to raise short-term rates, the return on these mutual funds is so low that it might not seem worth investing. Yet at the end of Q3 2017, investors held more than $2.7 trillion in money market funds.1 What's the appeal with such a low return? In two words: stability and liquidity. Money market funds are mutual funds that invest in cash-alternative assets, usually short-term debt. They seek to preserve a stable value of $1 per share and can generally be liquidated fairly easily. Money market funds are typically used as the "sweep account" for clearing brokerage transactions, and investors often keep cash proceeds in the fund on a temporary basis while looking for another investment. They can also be useful to keep emergency funds.